There were always beaders. There were always jewelry makers. But if you wanted to gain an understanding of the beads and jewelry findings and stringing materials and tools, their qualities, and what happens to them when they age, you would need to start with a little bit of the history of beads and jewelry making. And then progress into some more in-depth information about these materials, how you choose which ones to use, and what happens to all this stuff over time. Only in this way, would you be able to prepare yourself for the judgments and trade-offs and choices you will need to make as a jewelry designer. Choices about How? And When? And What? to use and not to use, given your particular project, your design goals, …(and if you’re selling your pieces, your marketing goals, as well). Moreover, how do you know how to assemble and link everything up into a finished piece? But often in this world, you don’t know where to start. You don’t necessarily know where to find answers, or whose answers to trust. When you began to make jewelry and bead, how did you know what to know? How did you initially get an Orientation? I’ve posted an extensive series (18 videos, 5 ½ hours worth of materials) of Orientation information on the Land of Odds website for you to take advantage of. These are also posted on YouTube. Continuing from an article I wrote…. 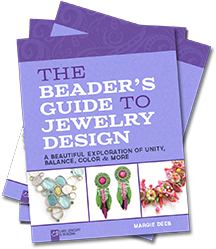 You need to prepare yourself for the multi-faceted world of beading and jewelry. It’s all about choices. You need an Orientation to what you need to know, and to the kinds of choices you will need to make. 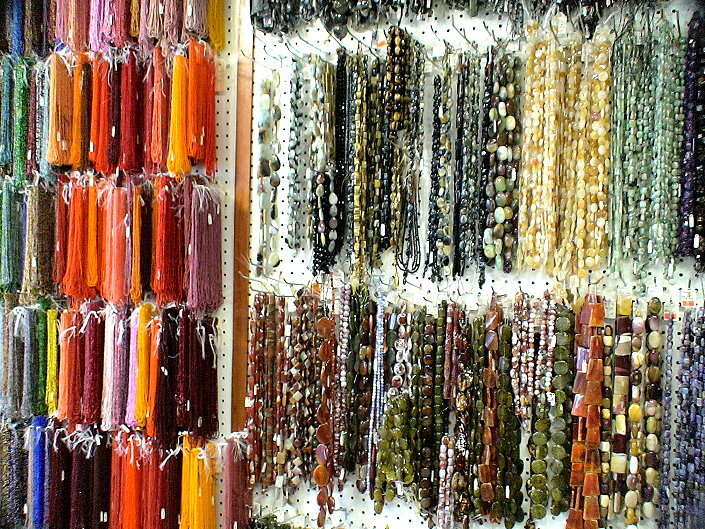 The world of beads can often be a jungle, dense with colors, shapes, and styles, intermingled irrationally, spilled relentlessly, collapsing around you with dumps and crashes and screeches and rings. Your eyes become useless in this heart of darkness. The presence of so many beads and so many strangely shaped and curiously articulated metal pieces may make the idea of creating jewelry and beadwork utterly meaningless. At least for the moment. But you can sense something more. It’s tactile. It’s visual. It has some kind of taste and smell which steers you. It’s orienting. It seems full of significance. And in this dark silence – so noisy with details, so hushed with confusion – you realize why it’s important that you need to know a lot of things. – You need to know how to step around quality differences among glass beads made in the Czech Republic, in Japan, in China and in India. How long will these beads last? Will they break? If they chip, what color will they be on the inside? Is the patterning in the glass a coating, a decal or some artistic placement of shards and stringers of glass? How sharp are the holes? How consistent are the beads from bead to bead on the strand? – You need to know when to demand 14KT gold fused to brass (gold-filled), or 14KT gold plate over silver (vermeil), or Hamilton Gold Plate over brass. How long does the shine and color last? Do these beads and pieces break or crumble or bend or dent? – You need to know how what came before you will be an important influence on you today. How have the Oglala Sioux, the Pope, Zulu tribes, the French, Italian, Czech, Dutch, African, the shoe and upholstery industries, and North American Indians affected beads and jewelry today? Most people don’t orient themselves when they get started. They either don’t see the need, or don’t think they have the time, or think there’s not that much to learn about. Anyone can put some beads on a string and make themselves a bracelet, they assume. They take any class that they can find, often taking more advanced classes, before having taken beginner classes. All they want to do is make a pretty piece to wear. The learning to design is secondary – or non-existent. They buy any book, try to reproduce any pattern, try to copy any picture they see in a magazine, and try to figure things out by themselves without any outside feedback, evaluation and validation. They overly-rely on the advice of the first people they talk with, and don’t question it. What happens is often very sad, indeed. You end up using inappropriate stringing materials and supplies. You end up finishing off your pieces incorrectly. You never learn how to best attach a clasp. You never learn how to control the tension of beads within your pieces. You mix pieces which are dysfunctional when used together. You end up taking the wrong classes, not questioning the advice of friends or instructors, and buying the wrong parts, given what you are trying to do. You end up making ill-informed choices. You need an Orientation, and you need to be sure you get one. In an Orientation, you’ll discover the order of things. There’s an arrangement to beading and jewelry design. Pieces have purposes and functions. They have a history of use and wear. They have an underlying vocabulary and grammar of construction – that is, they have rules for how things should get combined and assembled, and how they should not. An Orientation grounds you. It shows you the map, the pathways, the bi-ways, the highways along which you can travel in your development as a fine craftsperson, artist and jewelry designer. It gives you a sense of your surroundings, your context, and a lot of substance and meaning. At first, when you get oriented, you marvel at the details and the possibilities – the myriad types of beads and findings and stringing materials, the wide variations in how they work and function, the multitude of choices which seem overwhelming. Pinks become fuchsias become reds become oxbloods become garnets. Peridots become mints become olivines, both green and brown, become green lusters become jades become dark kellys and smaragds. Metalized Plastics become nickels become brasses become pewters become sterlings and argentiums and fine silvers and platinums. Threads become bead cords become cable threads become cable wires become hard wires. Jewelry is clasped or clasp-less, strung or woven, wire-worked or wire-wrapped, singular or multiplexed, fixed or adjustable, singular- or multi-media. But then, something else strikes you. You come to know that, while there’s always been a fundamental sense of design across time and cultures, this sense has often been understated. You find indifference, not indignation. You find an absence, a void, a vacuum of intellectual introspection about jewelry and its design. It’s all around you. That something missing. You feel the lacking. And when you begin to have this sense, you should feel a little superior, in that you are now on your way towards understanding design. You’ve got the hunger. You’ve got the passion. You want to know the place of design in jewelry, and your place in the design world with that jewelry you create. That jewelry you construct. That jewelry that you put forth into the world. That jewelry which reflects who you are as an artist, to your inner most thoughts. I never had an orientation. I was never oriented. I sank or swam. There was no real internet, when I started. Nor any beading magazines. Never met people in Nashville who made jewelry. Except for my partner, James, who made beautiful things with whatever parts and beads and stones he could find. But he couldn’t articulate exactly what he was doing. He was “Creating”. The act of “creating,” did not result in unbreakable pieces, or a mix of pieces which endured the ravages of wear equally, or clasp assemblies which never came undone. The act of “Creating” gave few clues about hole sizes and hole sharpness and stringing material flexibility, and what led to good drape. The act of “Creating” merely resulted in beautiful things – wearable, drape-able, moveable, durable, or not. During the first two years I made jewelry, things broke. The finishes of beads rubbed off. The beads did not necessarily lay right. Many pieces were too stiff – lacked good ease. The pieces kept selling, so what did I care? But at some point, I did begin to care. I was irritated by the number of repairs I had to do on my own pieces. 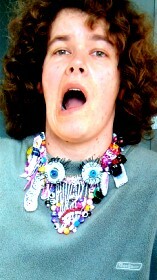 At one point, I began taking in repairs of other jewelry artists’ work. This was my education. I saw where things broke. I saw the choices other people made in determining how to construct their pieces from end to end. I could talk to the customers and find out a lot of the things leading up to their jewelry breaking. I began to ask more questions of my suppliers. I began to ask more questions about myself and my choices. I began formulating hypotheses about why some things worked or endured better than others. And I had many opportunities, now that I was doing a lot of repairs, to test out these hypotheses. But it would have been much better had I had a more formalized, organized, intelligent orientation when I first got started.